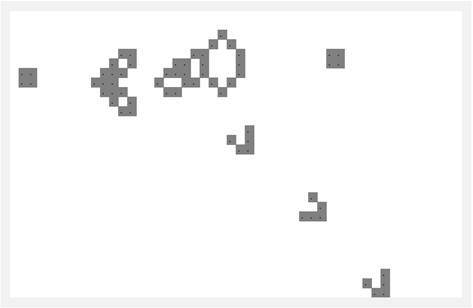 A couple of days ago, I overheard my fiancée helping her nephew as he struggled with Conway’s Game of Life in his introductory course on computer programming. 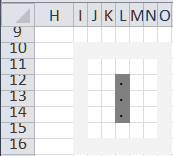 I hadn’t thought of this simulation in a long, long time and decided to see if I could do it in Excel. For an introduction to the simulation see http://en.wikipedia.org/wiki/Conway%27s_Game_of_Life. 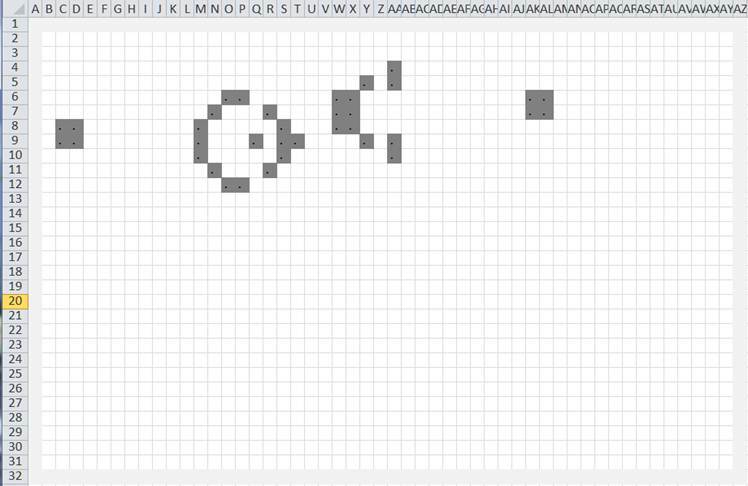 The first attempt was primarily in VBA with Excel used simply to show the result. It turned out to be an interesting exercise since I decided to make it a test case for an add-in meant to work in Excel 2003 through Excel 2010 both 32-bit and 64-bit and on Mac Excel 2011. I’ll probably share that experience at a later date. Then, I decided to see if I could run the simulation strictly in Excel. No VBA code allowed. This post shares that experience. A cell that is currently OFF (dead) becomes ON (alive) in the next iteration if it has exactly 3 live neighbors, i.e., neighbors that are ON. A cell that is currently ON (alive) remains ON (alive) if it has 2 or 3 ON (live) neighbors. Too few or too many and it turns OFF (dies). These two simple rules can yield some fairly interesting universes including self-repeating patterns like the two below. An important item to note is that the state of the next generation depends strictly on the state of the current generation. What that means is that we use the current state of all the neighbors of a cell and we do not mix-and-match the new state of those neighbors that we might have already calculated with the current state of the other neighbors. This requirement, then, requires that we have 2 grids, the current grid and the next grid. Once the next grid is fully known, it becomes the current grid and we can then iterate the process. This post builds the blinker pattern in a 5x5 grid. Starting with a small grid makes it easy to follow the development of the simulation. In addition, scaling the result to larger sizes is very easy and requires no additional conceptual or model changes. This is a 5x5 grid with a 1 cell border that is shown in light-grey. The “off” cells contain the formula =”” and the ON cells contain a dot (.). Conditional formatting makes those cells appear with a dark fill. The first thing to note is that since the next state of a cell depends on its current state, we will have to use a recursive formula (known as an iterative formula in Excel). To enable this capability – it is not on by default – select File menu | Excel Options button | Formulas tab | Enable iterative calculation checkbox. Also, make sure that Maximum Iterations is 1. As explained above, the new state of the grid depends on the current state of the grid. 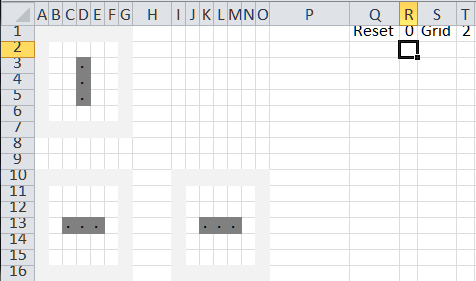 The only way to make that happen in Excel is to have two grids, each of which is calculated from the other (this is where the iterative calculation comes in). Of course, now that we have 2 grids, we have to designate which one contains the current state. 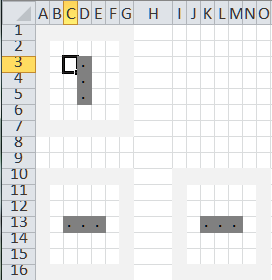 The way to do that is to create a third grid that “points” to the correct grid. In building an iterative solution – any iterative solution – it is always a good idea to include a ‘reset trigger.’ This forces the iterative solution to reset itself to the starting condition. In addition, in our case, we need a toggle that indicates which is the current state. This toggle will flip between the top grid and the bottom grid. The Reset trigger is a cell in which entering a 1 will lead to a reset. The Grid toggle cell contains the formula =IF(R1=1,1,MOD(T1,2)+1). 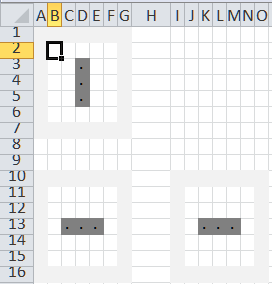 The formula states that if the game is reset, return a value of 1, which “points” to the top grid. Otherwise the MOD(T1,2)+1 toggles the value between 1 and 2. Note that the formula is in cell T1 and that it refers to the same cell. This makes it an iterative formula. A cell that is currently dead becomes alive in the next iteration if it has exactly 3 live neighbors. A cell that is currently alive remains alive if it has 2 or 3 live neighbors. Too few or too many and it dies. But, how about the boundary cells? Do we need specialized formulas for the cells at the four corners, the top and bottom rows, and the left or right columns? At first, it might look like we do. After all, these cells don’t have the 8 neighbors that an inner cell does. But, we can work around this issue by adding an outer ring of cells that will always be off. Now, the boundary cells become inner cells and we can use the same formula for all the cells in the grid! Let’s look at the three that we have. The 2 grids on the left are where the calculations happen. The third grid is the one that shows the current result. First we address the top grid. Then we look at the lower grid. Finally, we pick which grid is the current grid. Here’s what the formula does. The first test, $R$1=1, tests the reset trigger. 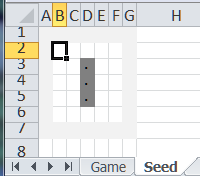 If it is 1, i.e., the game has been reset, the formula returns the value from the same cell in the seed worksheet. If the game is active, the next test $T$1=2 checks which of the top or bottom grids contains the current state. If it is 2 then the top grid should remain unchanged. So, the formula returns the current value in the cell itself. This is a recursive, or iterative, result. Finally, the cell is currently on and it will remain on only if it has 2 or 3 neighbors that are on. I could have used an OR function. Instead, I leveraged the fact that the count of ON neighbors will be a number between 0 and 8. So, I used the CHOOSE function to return either a “” or a “.”. Copy the formula from B2 to all the cells in the grid B2:F6 to complete the calculations for the top grid. This formula is a “conceptual mirror image” of the formula in B2. If the game is in reset mode, the bottom grid should be empty. So, the formula returns “”. If the game is active and the toggle points to the top grid ($T$1=1), the formula returns the value in the cell itself. 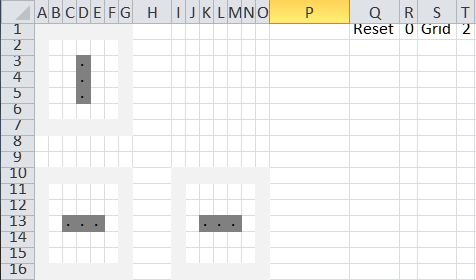 If not, then the calculations for the cell being currently ON or OFF are the same as above except now the references are to the top grid rather than the bottom grid. In J11 enter the formula =IF($T$1=1,B2,B11) and copy it to all the cells in J11:N15. 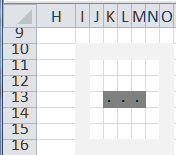 This formula selects either the cells from the upper or the lower grid depending on the value of the toggle in T1. 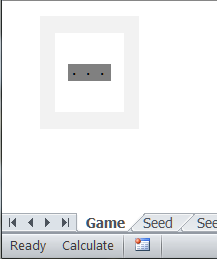 To start the simulation, reset it to the seed configuration. The final grid (J11:N16) shows the upper configuration grid, which is also the seed configuration. Change the reset trigger to 0. This starts the simulation. The toggle (T1) changes to 2 and the result grid shows the data from the lower grid. Press F9 (the recalculate keyboard shortcut) and the result grid shows the next generation. Since this is a blinker pattern the two below patterns repeat over and over again. Here’s one place where VBA might play a role. 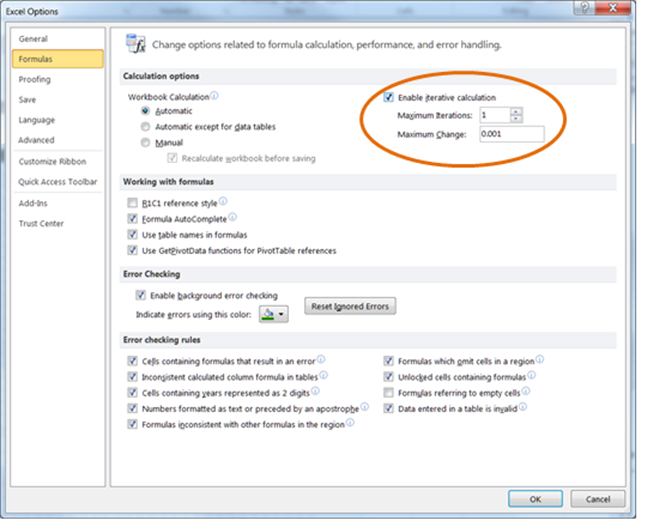 Write a small macro that repeatedly asks Excel to carry out a recalculation. We used the 5x5 grid since it was easy to understand. Luckily for us, the model scales very elegantly. 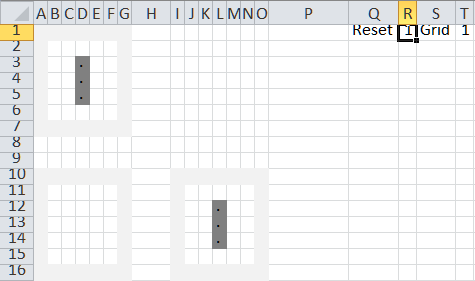 Creating a 30-rows-by-50-columns grid is simply a case of inserting the appropriate number of rows and columns and copying the formulas over to the newly added cells. Below is a snapshot from the Gosper’s Glide Gun simulation.